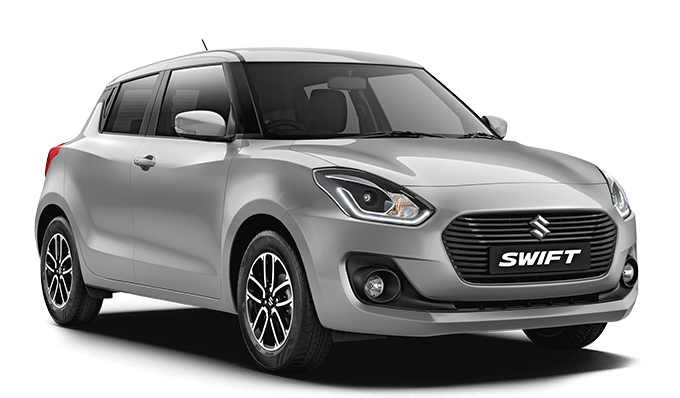 New Maruti Swift was launched in India at Auto Expo in February 2018. The brand recently hiked the price of the car by up to INR 3000. 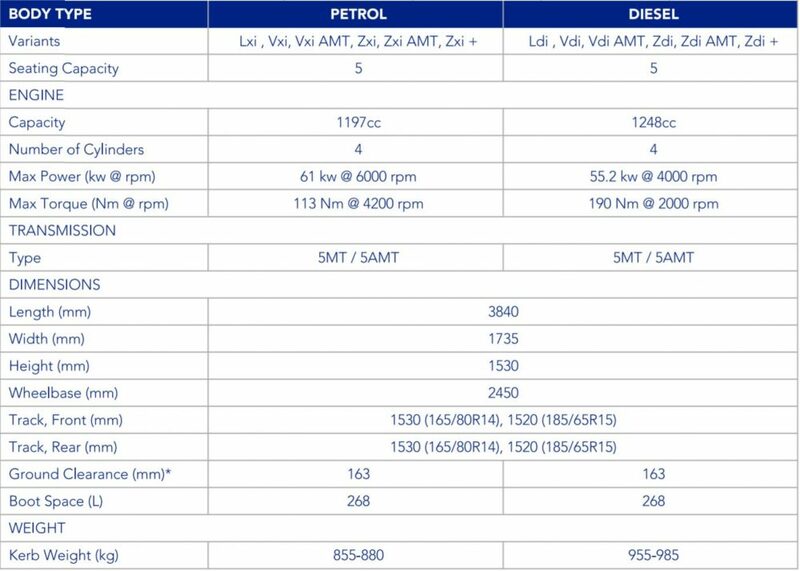 Every variant can be bought in two engine options with diesel being approximately INR 1 lakh expensive than their petrol counterparts. 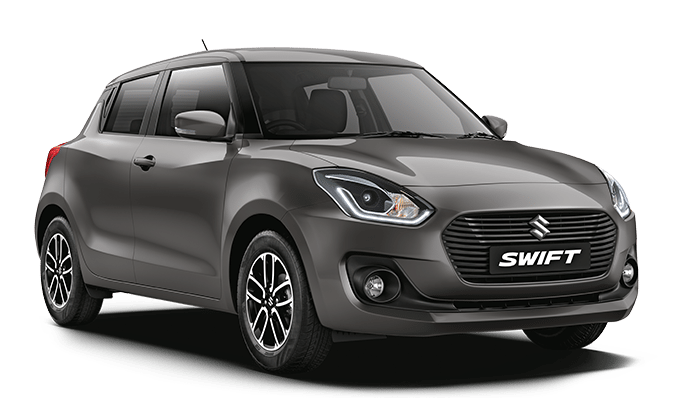 The pricing take Swift much closer to the bigger cousin Baleno. 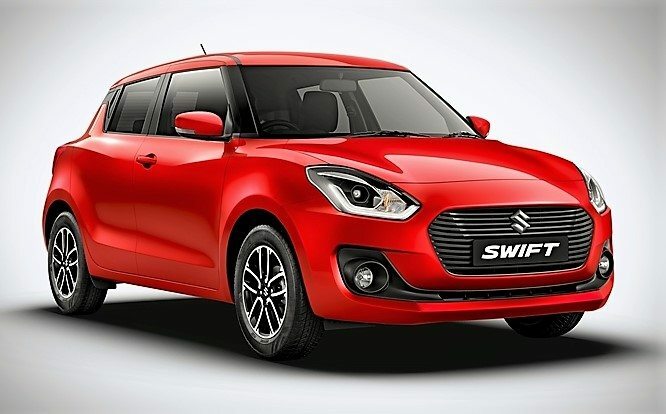 Swift is now available in four trim levels namely LXi/LDi, VXi/VDi, ZXi/ZDi and ZXi+/ZDi+. 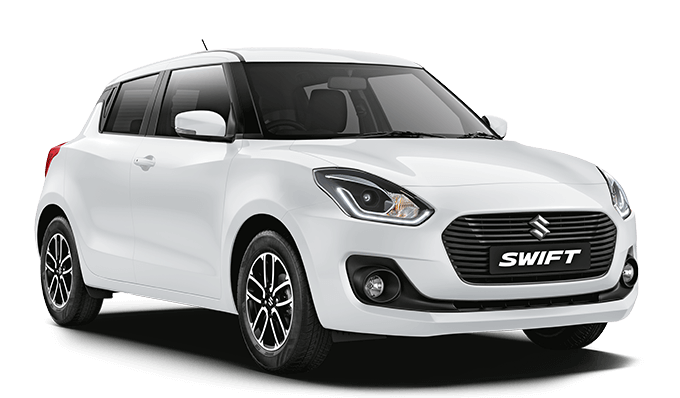 This makes 8 manual variants for the 2018 Swift, and 6 AGS variants named VXi/VDi, ZXi/ZDi, ZXi+/ZDi+ completes the Swift lineup. Out of total 14 variants, 7 are petrol and 7 are powered by a diesel engine. Here is a detailed feature list for all variants available on new Swift. 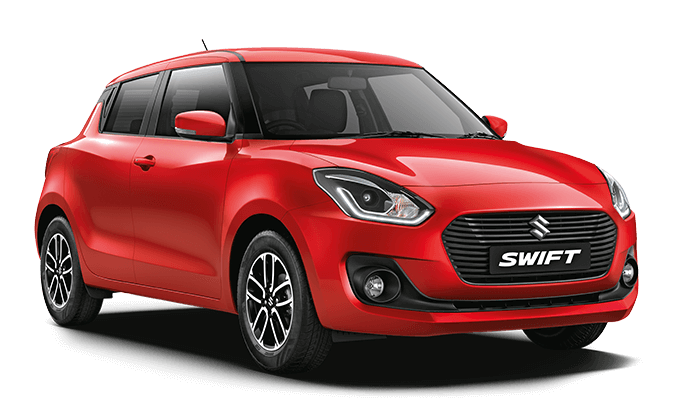 Starting with the LXi/LDi feature list, Swift now offers LED rear lights, steel wheels, body colored bumpers and Amber illuminated console without a tachometer on their base variants. 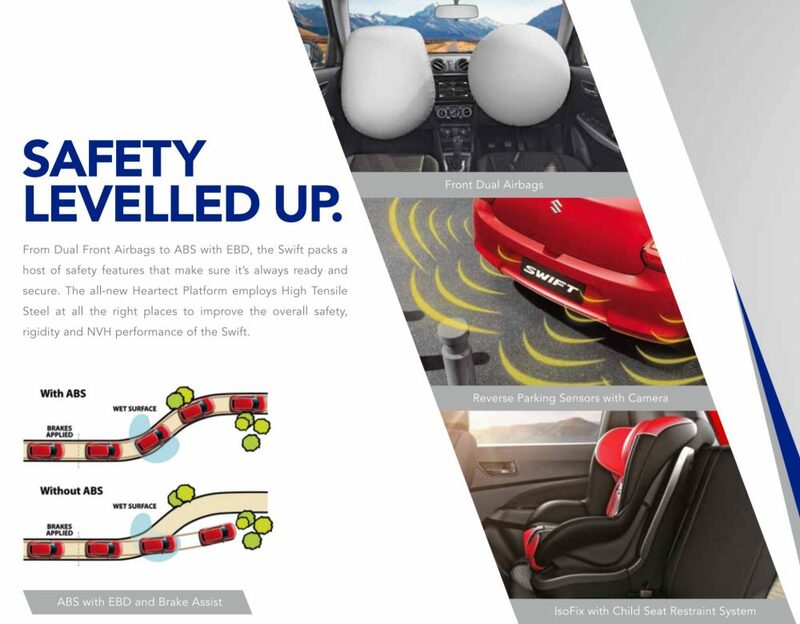 Safety is given highest priority with 2 front airbags, seat belts with force limiter, ISOFIX child seat anchors, engine immobilizer, seat belt reminder, Anti-Lock Braking System (ABS), Electronic Brake Distribution (EBD) and Brake Assist (BA) as standard on all trims. 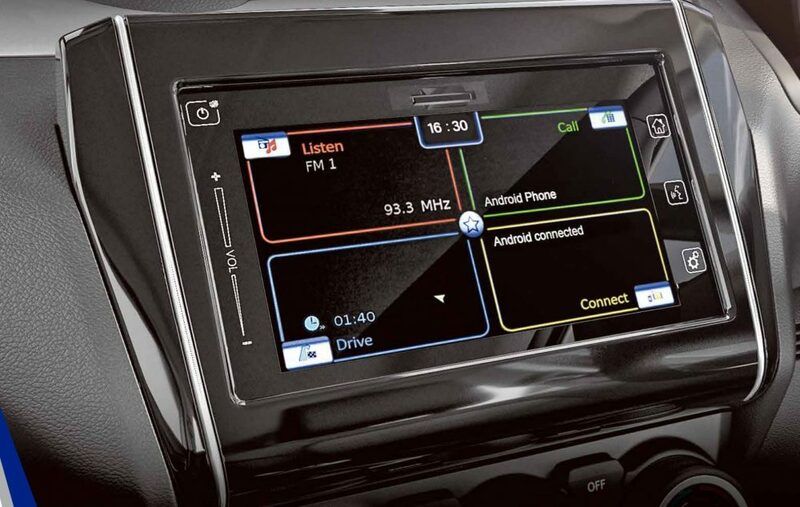 LXi/LDi comes without any music system while other features on offer includes manual air conditioner, power steering, internally adjustable ORVMs and front accessory socket. 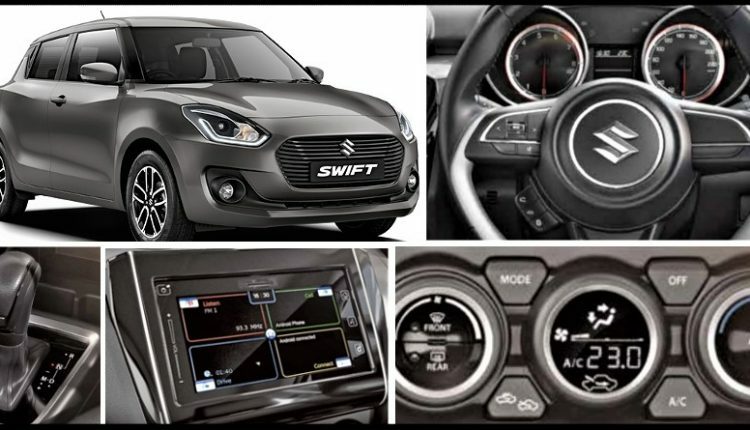 Moving to VXi/VDi, the middle trim comes with (adding features from the L variants) full wheel covers, indicators on ORVMs, body colored ORVMs and handles, all-new instrument console with tachometer, chrome and piano black interior finish, security alarm system and day/night inner rear view mirror. 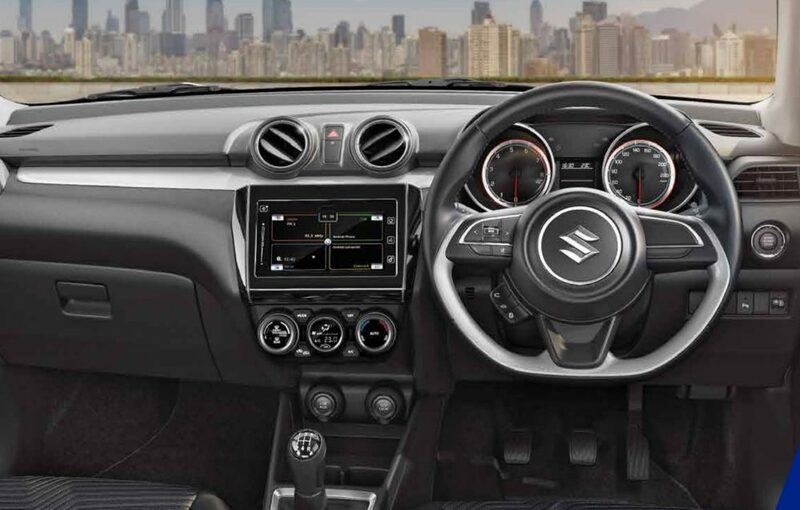 Maruti offers music player with four speakers, steering mounted controls, central locking with key-less entry, power windows, electrically adjustable ORVMs, height adjustable driver seat and rear parcel shelf. 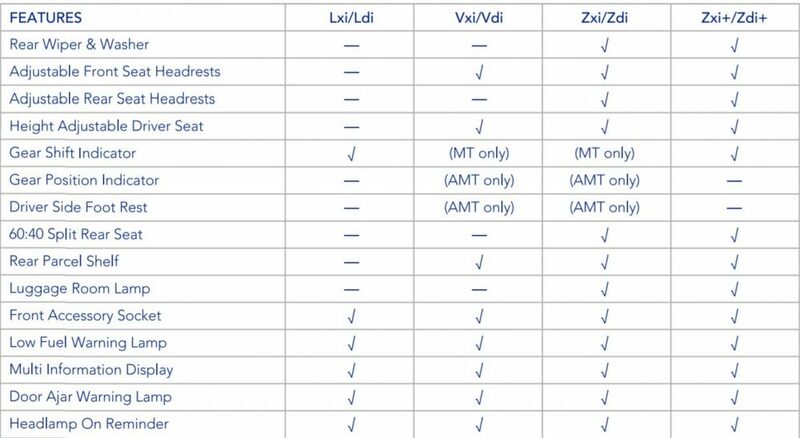 Both LXi/LDi and VXi/VDi trim comes with 165/80-R14 wheels. 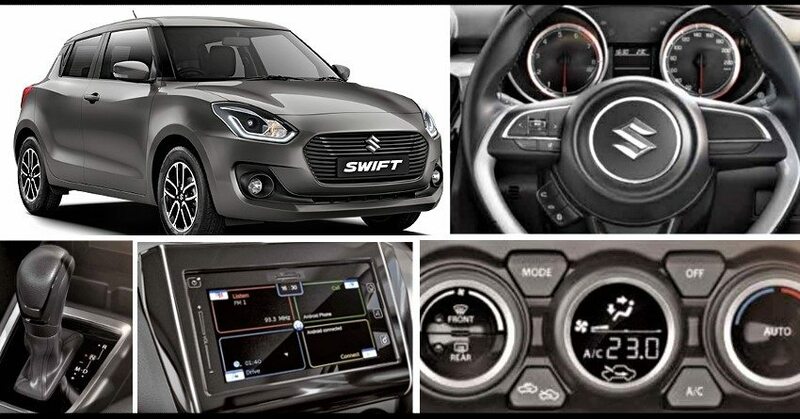 Over the V trim, ZXi/ZDi variant offers standard alloy wheels, reverse parking sensors, front fog lamps, two additional tweeters, smart key with push start button, automatic climate control, electrically retractable ORVMs, rear wiper with defogger, adjustable rear headrests, rear split seat and luggage room lamp. 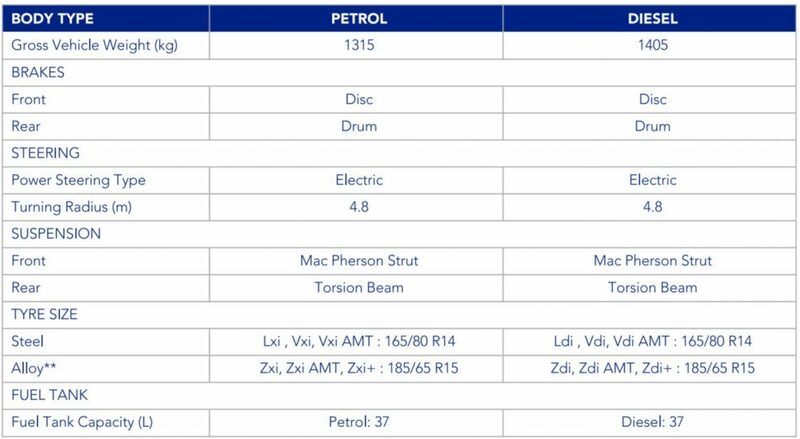 Both Z level trims are offers with 185/65-R15 tyre size. 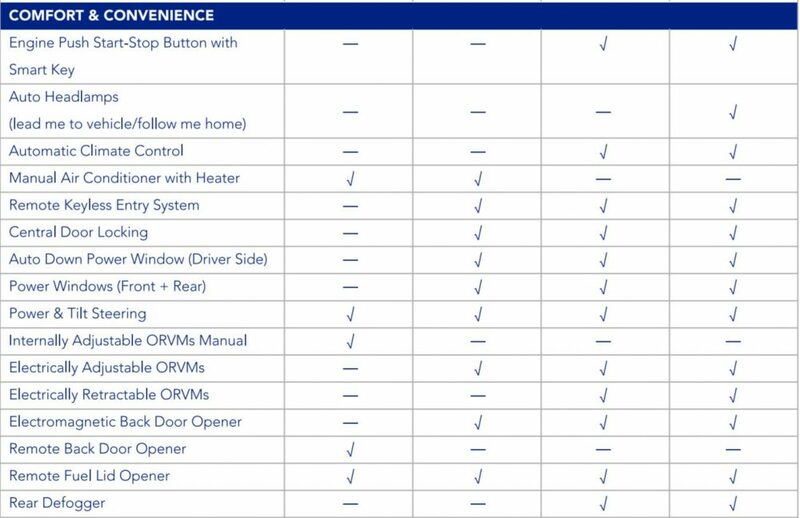 However, the AGS variant on V and Z comes with outside temperature display, driver side footrest and gear position indicator. 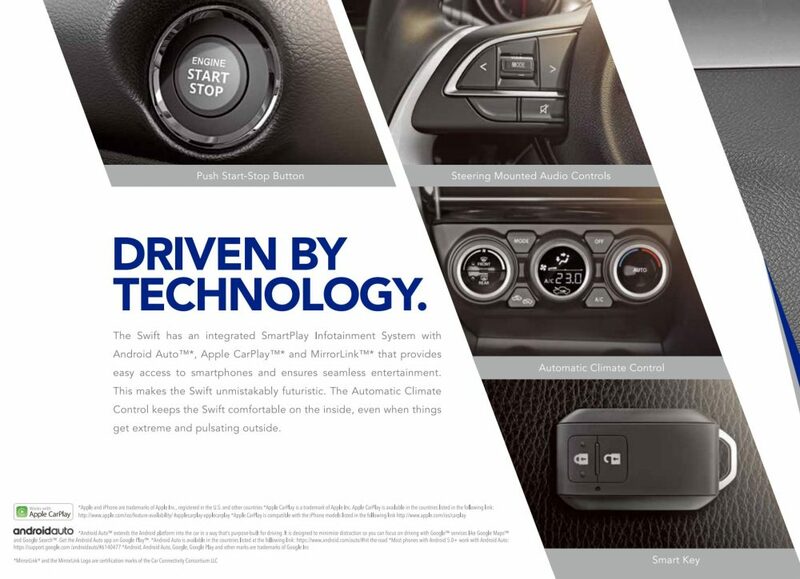 Top spec Zxi+/Zdi+ comes with impressive features such as LED projector headlights with inbuilt daytime running lights, precision cut alloy wheels, reverse parking camera, SmartPlay infotainment system and auto headlamps. All the variants measure 3840 mm in length, 1735 mm in width and 1530 mm in height. The wheelbase remains healthy at 2450 mm. Maruti claims 163 mm of ground clearance and 268 liters of boot space for 2018 Swift. The weight range falls between 855-985 kg.